Start 2017 with a boost to your professional skill set with some free education. 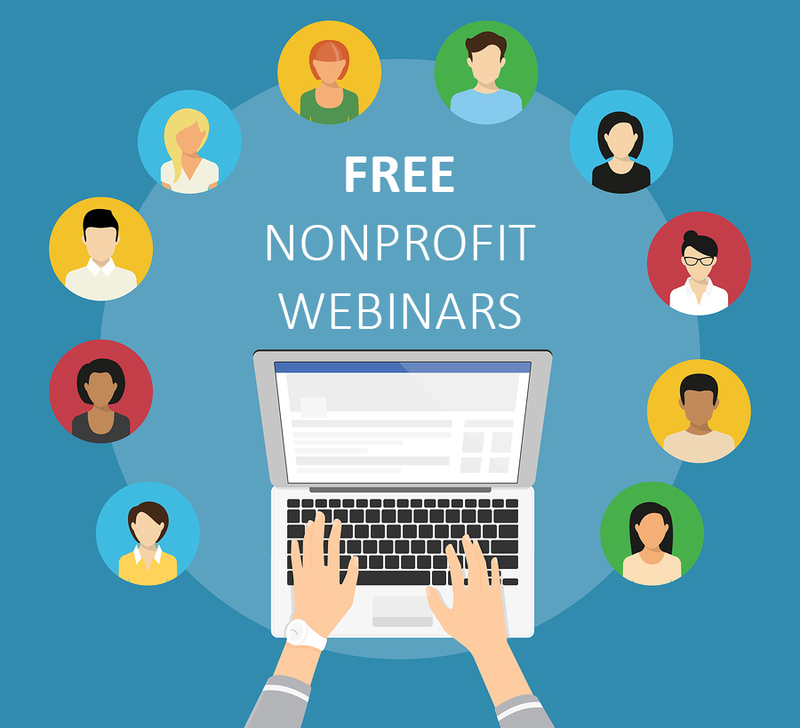 Each month we compile a list of the best free nonprofit webinars for you to attend. This month's webinars feature online fundraising best practices, software training, and how to find new donors this year. And of course, we've brought back four Wild Apricot favourites this month covering how to fill up your events, retain more members, turn your website into a membership growth engine, and the solution that 1000's of organizations are using to grow. Click here to sign up. Asking is scary. As a result, too often nonprofits spend tons of time cultivating, cultivating and cultivating. But they never get to the ask! Or, if they do, they leave money on the table. To assure that you cut to the chase requires a plan and a disciplined approach. In this webinar we’ll learn the "magic" formulas: (1) How to powerfully cultivate donors so they're predisposed to say "yes;" (2) When the time is ripe for the ask, and (3) How to do it so you get the most successful outcome possible. Asking strategies: What works; what doesn’t? here is no one right way to ask for a donation. Some people take great care preparing well-organized and complete presentations. Others prepare with just a few talking points and then use the energy of the prospect to guide the conversation. Some people are energized by the prospect of tying down a gift. For others it is a great act of courage. Join Brian Saber, President of Asking Matters, to learn about the revolutionary concept of Asking Styles created by his company. Learn about the features and functionality of Microsoft's Windows Server. You'll get a peek "under the hood" to see some of the newest features from Microsoft's principal program manager for the Windows Server program, Jeff Woolsey. The nonprofit governing board has been described as an ineffective group of effective people. Why do nonprofits so broadly fail to use their boards wisely? And how might they do better? This webinar will touch upon a comprehensive range of issues in a way that will be relevant to almost every nonprofit board. We will look at four interrelated areas: membership (including recruitment, development, self-assessment), process (including structure, meetings), capacity, and fiduciary concerns. How to assemble an effective board. How to structure and operate a board effectively. How to engage trustees and increase mutual satisfaction. 10) I Didn't Know Adobe Acrobat Pro DC Could Do That! Few people harness the real power of Adobe Acrobat Pro DC. An Adobe PDF is much more than a document destined for the print queue. From creating proposals and assembling training materials, to improving processes involving collaboration and rich media integration Acrobat is THE most versatile tool. Whether you are a nonprofit staff person, development director, librarian, or an administrative professional this session will demonstrate how Acrobat can transform and repurpose existing materials for a more efficient environment for a number of common and complex tasks. See how everyone can maximize resources and save time by applying Acrobat's new innovative tools, collaborative workflows, and versatile re-purposing features. If you’re thinking about starting a monthly giving program, this free webinar is for you! Join us to learn the basic fundamentals needed to start a Monthly Giving program, so you can benefit from the tremendous opportunities it can offer your organization. Blueprint is the annual industry forecast written by Lucy Bernholz about the ways we use private resources for public benefit. Blueprint provides an annual overview of the current landscape, points to major trends, and directs your attention to horizons where you can expect some important breakthroughs in the coming year. In 2017, the independent sector faces an increased blurring of the lines between: government and philanthropy; and digital infrastructure and civil society. Join us for a discussion around the topics of Philanthropy Blueprint 2017 and how local philanthropies are reacting to these trends. One of the biggest challenges facing organizations is changing the culture of giving and engagement, and our futures depend on it. Often we get so caught up in 'the ask' that we forget what motivates people to support us in the first place: relationships. In this webinar, join Dana Ostomel, Firespring's vice president of nonprofit industry development, to discover the secret sauce of cultivating a community primed and ready to support you. What donor stewardship means in an online world. How to fire up board members, volunteers, donors and staff to fundraise every day. Why a consistent communications plan is essential. How to generate loyal support long past a specific campaign. Although campaigns serve their purpose and give donors an exciting event to rally around, the time in between initiatives can make all the difference. We guarantee you’ll walk away confident in the steps you need to earn the trust and vigorous support of your community online. Did you know that over 75% of funding comes from individuals? It costs twice as much to find new donors as it does to keep your existing donors. When you follow the tips outlined in this webinar, you’ll learn how to prevent donor attrition and develop new donor relationships. Our methods are tailored to suit your needs and can integrate easily into your current stewardship efforts. Finally, a webinar that guides you every step of the way to recruit and keep your donors too! What are 9 new places to find donors offline? What are 4 effective ways of building your email list? Buying potential donor mailing lists: How do you vet the list? How can you use the list? What are the stages of giving to help you steward your donors towards larger gifts? What are stewardship and cultivation tips to keep your valuable existing donors? How does transparency raise you more money? How often to mail and email your list? What are 5 cheap and fast ways to thank your donors? How to cultivate your volunteers to become donors? In this free webinar with TechSoup, hear from providers of technology support for nonprofits and public libraries, volunteer organizers of NetSquared and Tech4Good communities, and learn about resources to cultivate and tap into tech expertise in your area! Crowdfunding has quickly become a new tool in the fundraising toolbox to tap into your network to raise more money, faster, from a larger audience. It is changing the face of nonprofit fundraising as donors come to not only expect, but welcome, a more engaged approached to giving. Forbes reported that 30% of the $5 billion crowdfunded went to social causes, and this trend only continues to rise. Why crowdfunding is important for your organization. What campaigns crowdfunding can be effective for. The power of crowdfunding beyond rising the thermometer. Concrete steps you can execute immediately. The needs section is the most important section of a grant proposal. If the need for your project is unclear, reviewers will be frustrated and your efforts (at both fundraising and implementation) are likely to fail. This webinar, led by a grant writer with more than 20 years of experience, takes an in-depth look at how to properly explain and document compelling needs. Litmus tests of whether a need is properly cited and explained. The most common (avoidable) pitfalls when writing a needs section. Tips for using needs to make your proposal stand out. How to research and document needs.